Arroyo Salado Campground is an exciting place to camp among beautiful sandstone hills below the Santa Rosa Mountains in Anza Borrego Desert State Park. You don’t have to go far for an awesome view. Just pick a hill and climb. You’ll see the Salton Sea to the east, Santa Rosa Mountains to the north, Borrego Badlands to the southwest, and several more mountain ranges beyond, possibly crowned with a coat of winter snow. Anza Borrego Desert State Park is a perfect winter playground for more adventurous types, and it’s very popular with snowbirds. Campground Directions: From Highway 86 in Salton City (on the west side of the Salton Sea) head west on Highway S22 (Borrego Salton Sea Way) for 11.5 miles, then turn left (south) on the primitive road. The turn is easy to miss - slow down and look for a small campground sign just before the highway reaches a wash. The campsites are in the hills and you won't see them from the highway. Once on the primitive road you'll see the campsites, all within the first 1/2 mile. The Campsites: There are just a handful of campsites and these are best for small RVs under 30 feet. This campground is more popular with tent campers. 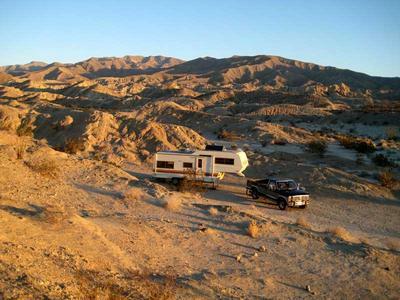 More Camping: Anza Borrego Desert State Park offers unlimited camping…you can camp pretty much anywhere – just don’t go off-roading to make your own campsite. Choose an already established site. The rules state you must be parked no more than 1 vehicle length off the road, and must not trample vegetation or drive over geological features. Sure, it’s close to the highway, but the campsites are in the hills so the highway isn’t visible and some of the noise is dampened. Highway S22 (Borrego-Salton Seaway) isn’t a terribly busy highway and is fine for bicycling. Recreation: There is so much to explore, much more than you’ll likely have time for. I camped here for almost 2 weeks and it wasn’t enough. There are several beautiful slot canyons weaving through the Santa Rosa Mountains here. Many can be accessed by heading southeast along Arroyo Salado Wash (the jeep road) then left (east) on Truckhaven Trail (another jeep road). 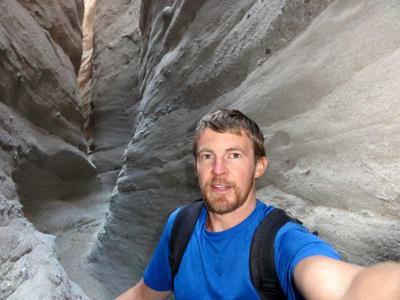 From Truckhaven Trail, pick a wash and head north across the highway and into the Santa Rosa Mountains, where several of these washes turn into magnificent slot canyons featuring vertical sandstone walls, some so narrow there’s just enough room for a hiker to squeeze by. Another excellent hike is to 17 Palms Oasis along Arroyo Salado Wash to the southeast. 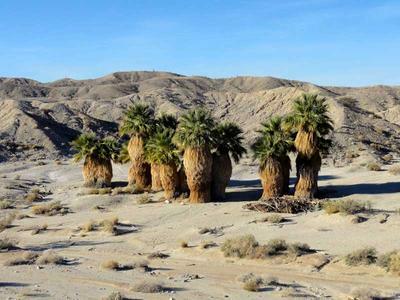 There are several palm oasis in Southern California. Most I've seen have been in rugged canyons, but it’s quite a sight to see this isolated stand of palm trees out in the open desert! There are also very nice views to be found by hiking south from the campground to the open desert. Palm Wash and Calcite Mine to the northeast also make excellent hiking destinations. Peacefulness: Highway traffic was light and road noise was faint. There was very light traffic in the campground, which is also the main jeep road to 17 Palms Oasis. I saw only a couple cars on weekdays, half a dozen or so on weekends. If you want peace and quiet, you'll find it here. Weather: Outstanding! Highs were in the low to mid 70s almost every day, lows were in the 50s. There was virtually no wind and very few clouds. A storm system moved in during the last couple days and brought a little rain, colder temps, and some strong 20-30 mph gusts. Otherwise it’s been perfect. This is the calmest campsite I’ve had in Southern California so far - in the roughly 2 months I’ve been camping here. Joshua Tree National Park was the windiest. Wildlife: Bats emerge at sunset and are fun to watch. There were also ravens, quail, hawks, a few hummingbirds, smaller birds including one with tan feathers and an interesting song, ground squirrels, and small lizards. Insects: A couple bees, and a beehive in the wall of a slot canyon to the northeast. Vegetation: Mostly creosote bush and ocotillo, also small cacti. Cell Signal: I had a pretty good Verizon cell phone signal – 3g when standing on the hill above my campsite. When using the phone in my RV, the signal sometimes cut out. Verizon mobile broadband internet was fairly fast with the external antenna place on my RV roof, ½ the time anyway…otherwise it was a bit slow National Access service. RV Solar: Plenty of desert sunshine! RV Campsite Rating: 10 out of 10. I have nothing to complain about here. The scenery is breathtaking, there is so much to see, it’s quiet, winter weather is perfect, it’s convenient being right off the highway, and Borrego Springs and Salton City are just a short drive away for supplies. 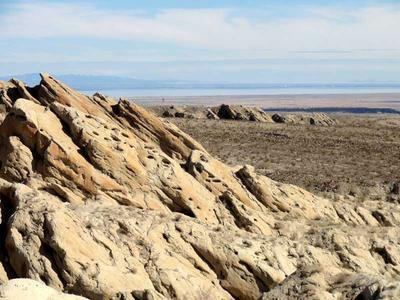 It’s a perfect base camp for exploring the northeast corner of wondrous Anza Borrego Desert State Park.